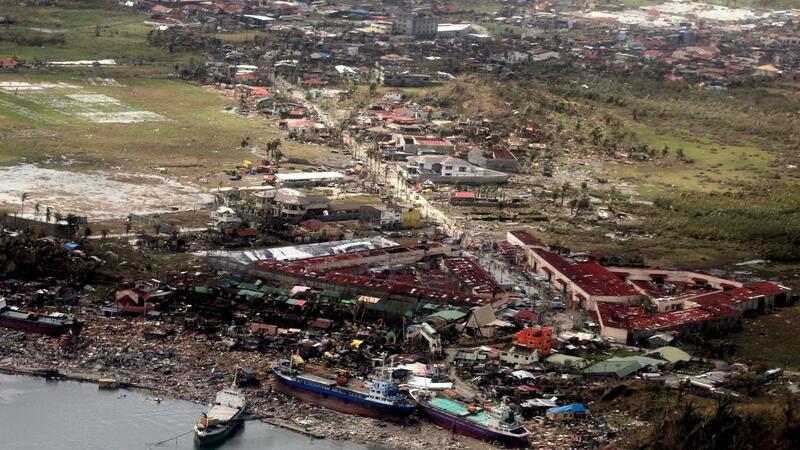 MANILA, Philippines — The death toll from a powerful typhoon that swept away coastal villages in the Philippines with a tsunami-like force is likely in the thousands, and could top 10,000, officials said Sunday as grim reports filtered in from the provinces. The typhoon Haiyan — also called Yolanda by Filipinos — blew through 36 provinces early Friday with gusts of up to 235 miles per hour. More than 48 hours later, confusion reigned over the extent of the casualties and damage with many of the most desperate trapped in remote, mud-choked coastal towns without power, transportation or telephones. Police superintendent Elmer Soria told reporters that officials in Leyte province in the central Philippines had estimated 10,000 deaths and that in some areas 70% of structures had been destroyed. Television footage showed wooden houses in splinters, cars floating on their sides through floodwaters, upended trees and telephone polls and houses with their roofs blown off.The official death toll Sunday night remained at 151, but the relatively low number was a reflection of the difficulty in assessing the damages. In Tacloban, a city of 220,000 that is the capital of Leyte province, officials said that more than 100 bodies had been found on the airport ground alone. The homeless and injured meanwhile crowded around the airport hoping to escape, or at least to find food or fresh drinking water. Reports trickled in from communities throughout the region of bodies lying out in the streets and floating in floodwaters. “We just made a mass grave for 57 people,” a shaken mayor, Edgar Boco from the small coastal town of Hernani told reporters. Approximately 80 U.S. Marines from the 3rd Marine Expeditionary Brigade stationed in Okinawa, Japan, were expected on Sunday evening, bringing with them two KC-130 aircraft, communications gear, and equipment. “The U.S. Marines are happy to help in this time of tragedy,’’ said Capt. Josh Diddams, a Marine Corps spokesman. As part of the Mutual Defense Treaty, the U.S. and Philippines conduct multiple bilateral training exercises to prepare for various scenarios, which include responding to natural disasters. At Manila’s Villamor Airbase, dozens of Filipinos were waiting to secure seats on the air force’s C-130 transport planes. Evangelista Sumalbag said she was sick with worry about her sister and daughter, a 28-year-old police officer in Tacloban. Philippine Interior Secretary Mar Roxas compared the ferocity of the typhoon to a tsunami, destroying everything in its path. One of the most powerful storms on record, typhoon Haiyan is now headed toward Vietnam, where it is expected to make landfall local time on Monday. More than 600,000 people have evacuated in anticipation although it is hoped the storm will lose much of its force in its journey.